Significance: Best Options For Accommodation in Srinagar houseboat is a unique experience - a honeymooner's delight. Just stepping on board transports one to a different world away from the hustle and bustle and noise of the city. As soon as one get out on the lake the traffic and confusion simply fades away. They are lined up in colourful ranks in Dal Lake, across from the boulevard, or along the Jhelum River. Those who want a little more isolation and peace can also find them at Nagin Lake. Houseboats originated in the Victorian era as a superbly British solution to a tricky political problem. The British liked Kashmir but the maharaja wouldn't allow them to buy land to build houses on. So they had houseboats built and the style has hardly changed from the first boat in 1888 right down to boats being built today. The houseboat could be carpeted and embellished like a 2 or 3 star hotel. Soothed by the sound of water lapping against the hull, one can relax in the cosy comfort of the living room or curl up with a book in the bedroom. 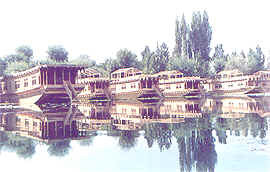 The houseboat attendant could cook up a mouthwatering Kashmiri meal or serve soups and more soothing European meal - depending on the choice of the customer. In the early morning one can see ravens and hawks swooping on the lake to catch insects and fish. Late in the afternoon the garden boats, laden with produce from the floating gardens, will glide by. Or the weed collector, with his boat, laden with the heavy and wet weeds of the lake. The view also changes with the season although the magnificent mountains of the Pir Panjal (also spelt as Panchal), with glimpses of the great Himalayas, are a constant backdrop. In winter the whole of this scene is covered with snow, with the exception of the clear waters of the lake itself. And even the lake freezes over in exceptionally cold winters. *Special Package Tours/ Under Expert Guidance * Piligrimage Tour to Amarnath Cave * Vaishnodevi/ Katra * Trekking Tours for Kashmir/ Ladakh/ Zanskar * Expedition to NUN/ KUN etc. * Water Trekking * River Rafting * Boat rides * Horse Riding * Trout Fishing * Car/ Coach * Snow and Water Skeing * City Sight Seeing Tours. *24 Hours Room Services * 24 Hours Travel Desk * Indian Continental Cuisine * Doctor on Call * Major Credit Cards Accepted * Safe Deposit Locks * Laundary Service * Internet Service * STD/ ISD Facility * Cable T.V./ Music * Heating Arrangements During Winter Months. MUGHAL GARDENS: Historical Gardens built by Mughal Emperors * Nishat * Shalimar * Chashme Shahi *and Trip to Shankaracharya Temple. SHIKARA EXCURSION: Dal Lake, Floating Gardens, Silver/ Golden Island, Nehru Park, Char Chinar and City Tours. SONAMARG: Whole mountains range covered with the glaciers and water falls forming in silver sheets the Meadow of Gold. GULMARG: Meadow of Sprinkled with Flowers the vale of Kashmir the highest golf course and to enjoy Gandola Chair Car. PHALGHAM: Stupendous snowy mountains dancing streams deep Forests, a meadow of Shepherds and Old Historical Monuments Avantipura, Saffron Fields and Springs.